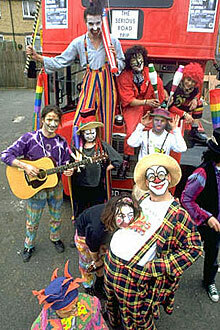 The Serious Road Trip was founded in the United Kingdom in 1991, by volunteers from the United Kingdom, Australia, New Zealand, France, Germany and elsewhere. For the next seven years, the Serious Road Trip took part in emergency relief and development programs throughout eastern Europe. The dedication of TSRT's volunteers and the organization's unique approach to aid using entertainment-based therapy have earned it widespread praise. TSRT's humanitarian operations began with a successful tour of orphanages and institutions in Romania, Poland and Russia, providing practical help and entertainment. In June 1992, TSRT's converted London bus joined the International Peace Convoy to Sarajevo, making TSRT the first British NGO to enter the besieged city. Over the two years that followed, TSRT implemented a vital aid distribution programme using an eight-truck fleet based at the Croatian port of Split to deliver aid throughout Bosnia-Herzegovina. The colourful trucks - painted bright yellow and emblazoned with cartoon characters - combined with the 'hands-on' approach of the TSRT drivers were a valuable asset in tense situations, giving TSRT a freedom of movement enjoyed by few other agencies. TSRT took advantage of this to deliver aid to many areas isolated by the conflict, including Sarajevo, Mostar (where the group relocated in 1994), Zenica and Tuzla. Between 1992 and 1995, TSRT's trucks delivered more than 3,000 tonnes of aid. In autumn 1994 TSRT also released its very own triple CD dance compilation, backed by Melody Maker magazine and artists such as The Orb, Drum Club, Transglobal Underground and Leftfield. The proceeds supported projects for more than a year, and were complemented by visits from artists such as ex-Iron Maiden lead singer Bruce Dickinson and chart-topping band Dodgy. MTV's 'Blah Blah Blah' magazine later dubbed TSRT "the world's most rock'n'roll aid organisation." The changing situation in Bosnia-Herzegovina removed the need for most convoy operations by June 1995. TSRT's trucks and drivers were shifted to more local development-based operations, including distribution of educational materials (Zenica/Tuzla) and support for reconstruction projects (Mostar). They also provided vital logistical support to TSRT's Olovo School Meals Project, which provided a nutritious daily meal to some 3,000 children in Central Bosnia over a six month period. This project was largely funded by the 'Help' compilation album, which topped the UK charts. Projects such as Bananas 4 Split, Theatre-go-Round, Mania 4 Romania and other tours of refugee camps and childrens' homes in Croatia, Bosnia and Romania brought circus-style entertainment, music and sport to thousands of children. As the original members of the Serious Road Trip moved on to other projects, the work of the organization was taken over by the French-based The Serious Road Trip - Connexion Humanitaire Française. TSRT-CHF continued to bring TSRT's unique brand of relief, based on circus and street theatre, to children in France and Eastern Europe. In 2002, TSRT-CHF launched the first ever Serious Road Trip project outside Europe, with the Kalashniclowns tour. The tour visited Kabul in Afghanistan and Afghan refugee camps in neighbouring Pakistan. Today, the Serious Road Trip is not one organization but several, a loose association of different groups all working to carry on the ideals and activities of the Road Trip. We currently count member organizations in France and in Romania, and more local groups are in the process of formation. Some current and former members of the Serious Road Trip have kindly shared their opinions and memories of the Road Trip on our surveys page. Read their responses to get an idea of what the Road Trip was really like and what it's about.